The term “eco-fiction” is, like other terms that describe types and categories, one for which a group of people are attempting to provide a specific definition, and yet at the same time it is a term widely and popularly quite undefinable. Other similar terms that apply are “environmental fiction” and “green fiction.” It seems there is an attempt to make specific requirements in the character of eco-fiction. “Nature” is a prime concern and forgetting about nature or putting it in the background is a main offense. Basically the whole point is to simply focus on and, perhaps, merely describe nature. But part of the problem of any of these definitions is that the term “fiction” itself is deeply non-ideological and many-faceted. The idea of an environmental type of fiction is actually exciting in the sense that, at a symposium on the subject or in an anthology, one might find oneself discussing the assertion that all fiction is eco-fiction. If nature is reality, fiction, a relatively modern art form, is a way of presenting nature, including nature in all its philosophical motion and ambiguity. Mary Woodbury, a Vancouver publisher, editor and writer—under the nom-de-plume of Clara Hume—is a person absorbed in environmentalism and most certainly is a writer of some excellent variety of eco-fiction. 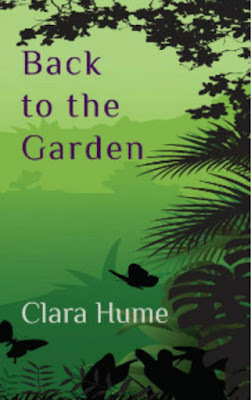 Her 2015 novel Back To The Garden from Moon Willow Press is a good starting place for a definition of eco-fiction. Her episodic tale begins in the mountains of northwestern United States, ventures to the Atlantic coast in search of relatives and roots and then returns again to the mountains—as a vague sort of “homeland.” It’s told in a fairly straightforward manner, without fantastical worm hole leaps into the future or past, rather in a time supposedly in the not-too-distant future—indeed, generally based on types of incidents that appear in today’s news. However, like science fiction from the 1950s, out of Galaxy magazine, from writers such as Ray Bradbury, or Gene Roddenberry’s 1960s allegories, and/or radio shows such as X Minus One and Dimension X, or like Cormac McCarthy’s more recent novel The Road; in Back to the Garden, the familiar U.S. landscape is transformed into a desolate wasteland of life reduced to a few survivors performing, of necessity, the most rudimentary functions. Yet, unlike much science fiction, the cause isn’t an unavoidable apocalyptic uncontrollably destructive nuclear war. Rather, the cause is a disintegration of society, government, civilization, infrastructure due to gross insensitivity toward fellow man and the environment. At one point, one of the characters says that the problems of society were caused by people ignoring the warnings. One of the main problems is that the heat of global warming has turned everywhere (except higher elevation mountains) into desert. Consequently, famine, from burnt fields and impossible growing conditions, and disease, from contaminated water, take their toll. The stench of dead bodies is everywhere. Two members of the core group die from influenza. Others are raped and mangled in gun skirmishes with marauders. The book begins with an unfolding description of a small somewhat random and lost group of outcasts and their tenuous interactions—with each other and their natural surroundings. They are so distant from governments and cities that they aren’t at first aware of the extent of the conflagration. In the book’s style of the writing, each chapter is told from the perspective of a different one of its characters—using the same technique as William Faulkner’s novel, The Unvanquished. Back to the Garden is like The Unvanquished in that a group of backwoods people encounter life’s trials as it journeys on its own along an unpopulated—and one might add “primal”—countryside. Other books that Back To the Garden remotely suggests are William Golding’s Lord of the Flies and, especially, J.M. Coetzee’s The Life and Times of Michael K. Hume’s (Woodbury’s) writing has a sketchy simplicity that suggests a glowing Surrealism in everything, just as in the writings of Franz Kafka. This is what I mean in saying that environmentalism is contained in the style of fiction. The characters are sensitive and meaningful. But their interactions are generally childlike and subdued, expressed in small gestures, a tear, a smile, a hug, a token. Though allowed, rationality is secondary. The characters know each other; they know each other superficially and, because of the travels, they know each other to some degree in their past. But Back to the Garden takes place in an immense and immensely uninhabited landscape. “Way up there the mountains stood as heartily as ever.” There is a spiritual source to life in the garden, but the spirituality, the “dream,” is derived from a direct contact with nature. The sprawling cities are deserted; only unfathomable space remains. “I shook off the old icons. They meant nothing anymore.” As pretense crumbles in its own instability, the real pleasures and rewards of life are brought forward. They are brought forward in their essential spontaneity and singularity. The patchwork presentation of a world that has radically fallen to pieces, as happens many times, in the Great Depression for instance, uncovers life of our species and planet on a level that reveals the paradise in which we have been dwelling all along. Tom Hibbard has had many reviews, essays, poems and artworks published online and in print publications. He had many reviews and articles published in the early version of Jacket Magazine. Other publications where his reviews and poems have appeared are Word/ For Word, Big Bridge, Galatea Resurrects and Solitary Plover. With Washington D. C. poet Buck Downs, this spring Hibbard read his poetry at Myopic Books in Chicago and Woodland Pattern in Milwaukee. He has written extensively on “visual poetry.” A long piece on Existentialism and Michael Rothenberg appeared in John Tranter’s Journal of Poetics Research. His poetry collection Sacred River of Consciousness is on sale at Moon Willow Press in Vancouver and Amazon.com. And his poetry collection Place of Uncertainty is on sale at Lulu online.